It’s amazing how much any kind of creative work is improved by a good night’s sleep. I just worked the sound board at a three-day festival, and manning the “audio pit” for a long weekend is exhausting work. At the end of the second day—Saturday, by far the longest and most tiring day—my band had to get on stage and perform for an hour, and somehow make the audience happy. We did a good job, despite all being tired. After a night of sleep, we performed the same set the very next morning. Unsurprisingly, at the morning set we were tighter, more cohesive; and we had a lot more energy. As I write this article on Monday afternoon, I’m also tired, but in a different way than I was over the weekend. I slept for ten hours last night, after an utterly exhausting three days. 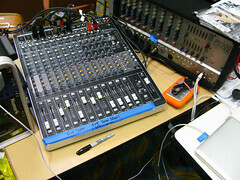 I was making snap audio mixing judgements, hauling the PA to and from the stage, and fighting microphone feedback. (Bass players and guitarists, please turn those amps down. Singers, if you must lie down on the stage floor when singing, please stay away from the monitor speakers. “Gripe, gripe, gripe,” said the sleepy sound guy.) I figured I’d get home on Sunday around six, relax for a few minutes, then bang out a decent article for the site. An article about… something. Anything. But I was tired; tired and wired from working thirty hours and living on caffeine over three days. I had a post about English plurals that I started in-between acts over the weekend, but that’ll have to wait until I’m feeling with it enough to be clever without being snarky. So, I’m taking a cue from Sara and doing this stream-of-consciousness post, one that’s essentially freewriting that I did while having a six-o-clock lunch. Of course, performing isn’t like writing, since the latter can be edited. This piece, written by a very tired man, isn’t the best thing I’ve ever written, but editing it after the fact has improved it. Performing musicians don’t have that option, since live music is ephemeral. I’m going to go to sleep tonight, not out of exhaustion like I did last night, but telling myself that I want to be well-rested for band rehearsal tomorrow. I imagine that we’ll talk about the gigs over the weekend. What worked, what didn’t, and what do we need to add for the next one (which will have us on-stage for four hours). Before that? I plan to get a good night of sleep. Neil Fein is a very tired freelance editor who specializes in novels. If you’ve written a manuscript or are getting close to finishing, you can get in touch with him here, and even ask for a free sample edit. He’ll work on it when he’s awake. He’s also the guitarist in the band Baroque & Hungry, who are performing in Bridgewater, New Jersey in a few weeks; he rides his bicycle as much as he can, and he paints when the mood strikes him. He’s also available for hire as a live audio engineer.